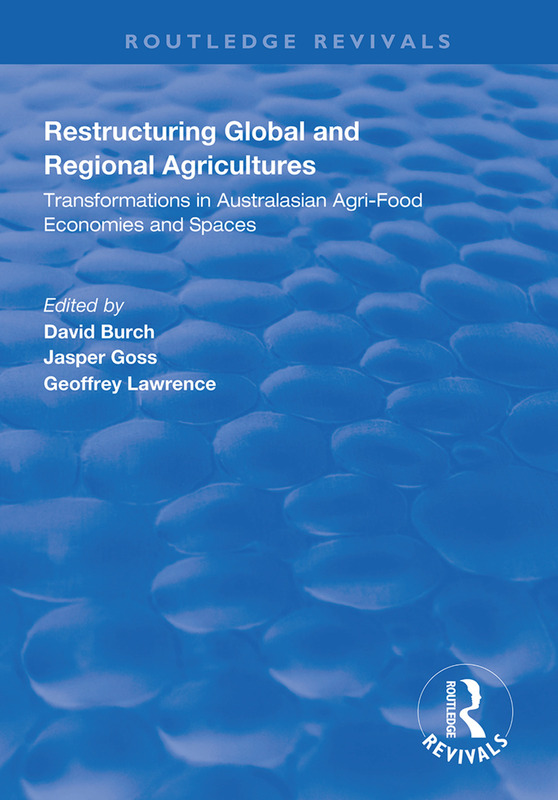 First published in 1999, this collection of papers represents the latest thinking on the effects of globalisation and agri-food restructuring from a regional and peripheral perspective. The book breaks new ground in our understanding of the relationship between the global, regional and local levels in the sphere of agri-food production. While Australia and New Zealand are important components of the agri-food system, the economic and political decisions which impact at the regional and local level are usually made elsewhere - often in the boardrooms of global companies and the political institutions of Europe and North America. At the same time, however, Australia and New Zealand have sought to establish some independent room for manoeuvre. In Australia this can be seen in the targeting of consumers in South East Asia, and New Zealand has experienced both sweeping deregulation and niche marketing of goods such as organic produce. The success or failure of these strategies cannot currently be determined, but this invaluable collection presents and discusses some possible future scenarios. Featuring 31 specialists in sociology, geography, social anthropology, veterinary science, environmental studies and sustainable development, it is a product of the Agri-Food Research Network. The volume includes 19 essays which attempt to conceptualise a series of global trends and their local ramifications, explore Australian and New Zealand experiences of agri-food restructuring in historic, ideological and discursive terms, and analyse local policy and politics and the influence on rural producers, along with studying four key concepts underpinning agri-food research and the possibilities for their application in new areas. Part 1. The Contemporary Dynamics of Global Agri-Food Relations. 1. Virtual Capitalism and Agri-Food Restructuring. Philip McMichael. 2. Switzerland’s Billabong? Brand Management in the Global Food System and Nestlé Australia. Bill Pritchard. 3. An Apple a Day: Renegotiating Concepts, Revisiting Context in New Zealand’s Pipfruit Industry. Megan McKenna, Michael Roche and Richard Le Heron. 4. New Zealand’s Organic Food Exports: Current Interpretations and New Directions in Research. Hugh Campbell and Brad Coombes. 5. The Organic Manifesto: Organic Agriculture in the World Food System. Andy Monk. 6. An End to Fordist Food? Economic Crisis and the Fast Food Sector in Southest Asia. David Burch and Jasper Ross. Part 2. Restructuring Within Australian and New Zealand Agri-Food Systems. 7. Capitalism, the State and Kai Moana: Mäori, the New Zealand Fishing Industry and Restructuring. Khyla Russell and Hugh Campbell. 8. Economic Restructuring and Neo-Liberalism in Australian Rural Adjustment Policy. Vaughan Higgins. 9. The Restructuring of Industry-Based Agricultural Training in New Zealand. Ruth Schick and Ruth Liepins. 10. Discourses of Community and Dairy Company Amalgamations in Taranaki, New Zealand. Carolyn Morris. Part 3. Agricultural Policy and Politics in Australia and New Zealand. 11. Markets as Politics: The Case of the Meat Export Industry of New Zealand. Bruce Macdonald Curtis. 12. Food Safety and the New Zealand Dairy Industry: the Politics of Stolle Hyperimmune Milk. Christina I. Baldwin. 13. Fertiliser and Sustainable Land Management in Pastoral Farming, Northland. Greg Blunden and Ben Bradshaw. 14. Doing Good, Doing Harm? Public Debate about Rabbit Calicivirus Disease in New Zealand. Gerard Fitzgerald and Roger Wilkinson. 15. Hiring Labour for Sugar Harvesting: Farmers, Farm Workers and Sub-Contractors. Michael Finemore and Jim McAllister. Part 4. Theorising Key Concepts in Agri-Food Research. 16. ‘Feed the Man Meat’: Gendered Food and Theories of Consumption. Steward Lockie and Lyn Collie. 17. Contract Farming in the New Zealand Wine Industry: An Example of Real Subsumption. Jason Mabbett and Ian Carter. 18. An Action Learning Approach to Grower-Focussed Change: Research Among Cotton Producers in Queensland. Geoffrey Lawrence, Melissa Meyers, Stewart Lockie and Richard Clark. 19. The Discourse of Sustainable Development and the Australian Sugar Industry: A Preliminary Analysis. David Grasby.